Telefónica are poised to pounce on any mistakes by Leg 6 leaders PUMA and CAMPER as the top three power towards the Miami finish line in close formation, while behind them a second great battle develops. 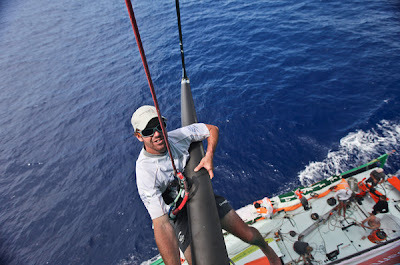 At 1300 UTC on Wednesday PUMA Ocean Racing powered by BERG held a lead of three nautical miles (nm) over CAMPER with Emirates Team New Zealand with around 1,900 nm to go. 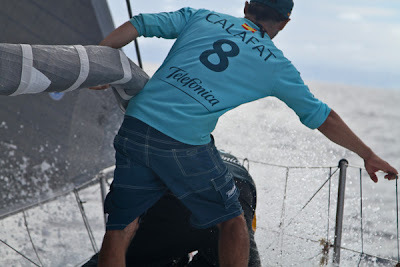 Overall leaders Team Telefónica were less than four nm further back in third and navigator Andrew Cape said the Spanish team were enjoying the trade wind sailing and “smoking along at 20 knots”. “It’s lovely sailing here,” Cape said. 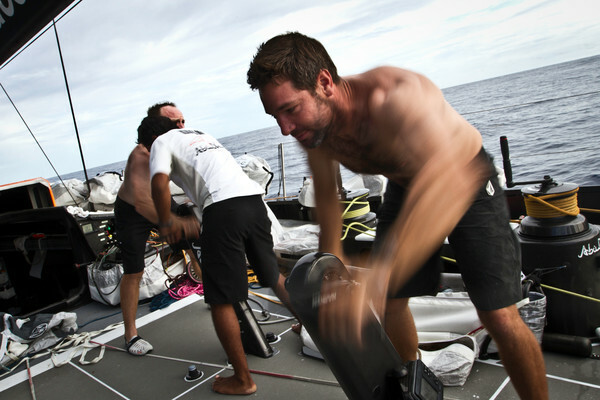 “We’re right into the trades, we’ve got 18 knots of breeze and we’re all in sight of each other." 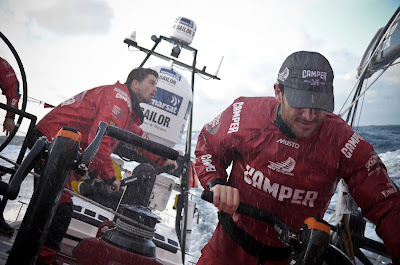 Cape said the Telefónica crew would do everything they could to close down PUMA and CAMPER over the next 24 hours of fast straight line sailing before the weather scenario got more complicated. The tussle between Abu Dhabi Ocean Racing and Franck Cammas’ Groupama sailing team was on a knife edge after the French team eased past Walker's crew and establised a narrow advantage of less than one nm. Walker said he was comfortable with Abu Dhabi’s positioning despite losing out when Groupama made gains by sailing hotter angles overnight. 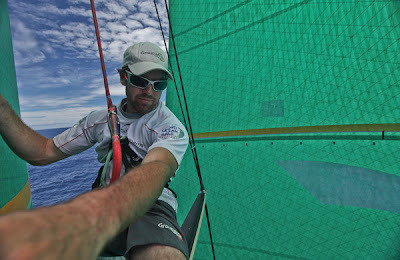 “We are happy to have some (lateral) distance between the boats at this stage. Being further south will hurt in the short term but maybe it will be an advantage in a couple of days' time. 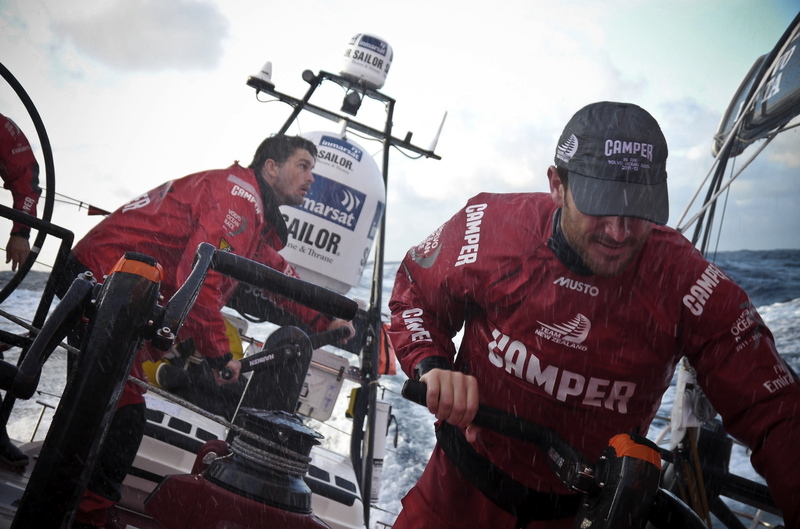 “The weather ahead looks very mixed and there still remains every possibility that the fleet will park up in light wind between here and Miami. Until then we need to try to stay as close as we can to the lead pack and hope something opens up for us." Walker said the warm weather and lack of rain on this leg had made personal hygiene a challenge and with “11 very smelly men desperately in need of a shower”, a bottle of shampoo was being kept in easy reach on deck in the hope of a rain shower. According to Walker the team’s arrival date in Miami was the crew’s main preoccupation along with the diminishing levels of fuel for the generator and food for the crew. Groupama skipper Franck Cammas said he was delighted to be back in touch with Abu Dhabi having made gains after a fast passage through the Doldrums. Cammas said he was eying up opportunities to make further gains on the leaders when the trade wind sailing came to an end in the next 48 hours. “The wind should drop in two days time,” he said. “We are happy to have unstable systems ahead and a break in the trades, because where there are light winds, there will be options. If there is very unstable wind and we could get back on track. 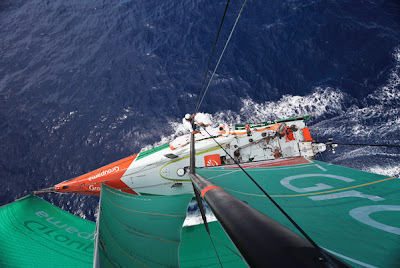 Cammas said the Groupama crew remained “calm and focused” as they tried to fight their way back into contention. “The atmosphere is good,” he said. There is no tension and we still hope to come back and do something good in this leg. Even though the fight is 100 miles apart, it’s still a fight." 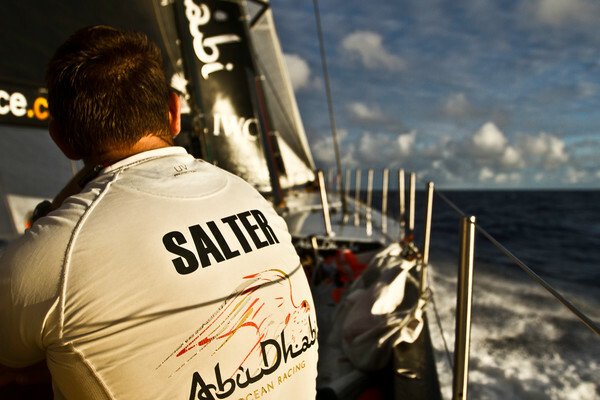 With his boat now undergoing repairs in the United States after having been shipped from New Zealand to Savannah due to damage on Leg 5 in the Southern Ocean, Team Sanya skipper Mike Sanderson said he was relieved to be making progress towards rejoining the race in time for the PortMiami In-Port Race. “It’s been very odd -- it doesn’t feel like I’m doing the Volvo Ocean Race at the moment,” Sanderson said. 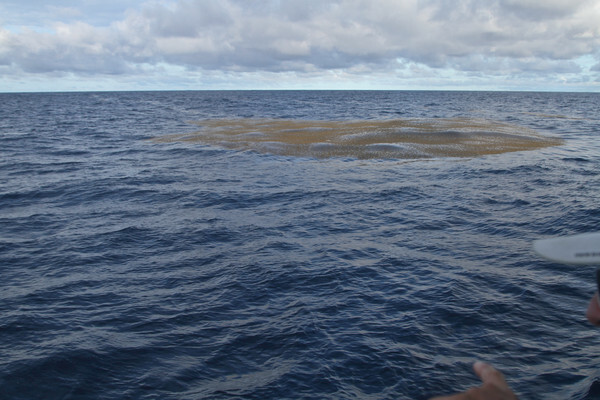 “It’s been much nicer since the boat arrived. I talk to the guys there at least a couple of times a day which is great, and much more refreshing. It feels like we’re back in the campaign.